My gauge’s display is flashing, what does this mean? | Imada Inc.
My gauge’s display is flashing, what does this mean? 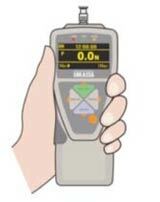 A flashing display when you turn on the force gauge indicates that the load cell has been overloaded and damaged. You need to send your force gauge to us for a repair by going to https://imada.com/repair-calibration/ and following the directions outlined on the page. ← How often should my gauge be calibrated?